...that the Cabal have altered Phobos' orbit around Mars? ...that Clan Redeem were the World's First to clear the Last Wish Raid, initiating the corruption of the Dreaming City in-game? "What is the Crucible? Before the days of the City and the Iron Lords, it was a place to pursue vendettas. To battle for territory, and pettier reasons. The whole world was a Crucible Arena. The Crucible today? To Cayde-6, it's a gambler's paradise. To Zavala, it's a resource sink where equipment goes to die. To Ikora, it's home—though she would never admit it. Partial answers. The tactics and techniques that will save us in wars to come are birthed in the Crucible, during live-fire training. The Vanguard are so preoccupied with their own agendas they're missing the Vanguard of tomorrow rising right before their eyes." The Crucible is the player vs. player game mode in Destiny and Destiny 2. Items bought or earned in the game can be used more effectively in the Crucible, and weapons/armor received elsewhere can also be used in the rest of the game. The Crucible will sometimes randomly reward players after matches, regardless of rank after the game, while players can also purchase weapons from the Crucible Quartermaster as well as Armor and Shaders from Lord Shaxx and Lord Saladin. The mode returns in Destiny 2, but the player cap was been reduced to 8 players at launch, but was later raised to 12 in all quickplay and Iron Banner modes. The HUD has been reworked to give players information on their opponents, such as whether they have their super attack ready or if they’ve picked up ammo for their power weapon. All Crucible maps are completely separate and unique from explorable locations in the game. Each map will feature nearly all game modes on them with exceptions made to much larger maps made to be used in the mode Combined Arms. Players start out with ammo for their Primary weapon, and a small amount for their Special weapon, though throughout each map, there are multiple chests of Special ammo, and Heavy ammo chests appear in the middle of the match that replenish more slowly than Special ammo chests. After Hotfix 2.5.0.2, all players lose their special ammo after dying, and must wait for a crate to spawn. These changes did not affect sidearms, the No Land Beyond or the Universal Remote. Anyone who opens heavy chest gains Heavy ammo for themselves, and any teammates that are close by, but can only be used once per game, with the exception of Mayhem game modes. Players are also restricted from using ammo syntheses, since it could potentially lead to an unfair advantage for one team over another. Level advantages are normally disabled in the Crucible in order to have an even playing field. The two exceptions to this are the Iron Banner and the Trials of Osiris, where level advantages are enabled. Private matches can also be set up to have level advantages enabled. This means that having high-level gear matters in those events. Also, Crucible bounties can be completed in Iron Banner matches, whereas Iron Banner bounties must be completed in Iron Banner matches. The Trials of Osiris weekend Elimination tournament also has special bounties that refresh every day of the event. In addition to standard Crucible bounties, every week Lord Shaxx has a set of weekly bounties that are more difficult to complete, with several objectives to complete instead of just one. Completing these weekly bounties will reward a Nightfall-tier reward such as a legendary or exotic piece of gear, as well as various materials. The "Mercy Rule" was implemented with the release of The Taken King. This allows matches to end early when one team has more than approximately 2/3 more score than the opposing team. When the rule is enacted, no more players may join the match and the game clock is forwarded to 10 seconds. After those 10 seconds, the match will end normally. All players will receive their end of match rewards and return to matchmaking, splitting up those teams so they can't get matched against that same team. Bungie will update the rule's identification function over time. Players who are successful in forcing a mercy rule will receive a special medal, but no additional rewards. 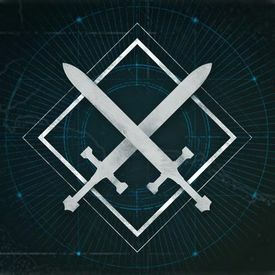 In a significant change from Destiny, all Crucible playlists in Destiny 2 are fought by two teams of four players each, except for Iron Banner which is six versus six. Power weapon ammo distribution has been reworked: Power ammo is now granted more frequently at various terminals across the map, but only a single player can access each drop, and Power ammo is lost on death. However after patch 1.1.4 a player killed while holding Power ammo will a drop brick of Power ammo containing 50% of their remaining ammo. Completing matches earns both gear and reputation tokens (with additional rewards dropped if players use a Boon of The Crucible consumable) to be redeemed for additional rewards at the appropriate vendor. Furthermore, no mode or event has level advantages enabled, ensuring that player skill is equally as important as obtained gear and loadout. The Mercy Rule from Destiny is enabled in all Quickplay modes, including Mayhem. Clash: 6 vs. 6 mode. All-out warfare with no special modifiers. Control: 6 vs. 6 mode. Players must fight for control of three zones around each map for extra points. Rift: 6 vs. 6 mode. Players must fight for a "spark" in the center of the field and deliver it to the enemy rift. Rumble: Free-for-all mode with 6 players. First one to reach the score cap wins. Skirmish: 3 vs. 3 mode. Players kill enemies and revive their teammates for extra points. Supremacy: 6 vs. 6 mode. Similar to Call of Duty's "Kill Confirmed" mode, players must pick up enemy "crests" to score points. Kills do not count towards victory and players can deny the other team points by picking up friendly crests. Combined Arms: 6 vs. 6 mode. Players battle on much larger maps than normal and are able to use Pikes, Heavy Pikes, Interceptors and their own Sparrows. Special medals are awarded for killing enemies with vehicles. Doubles Skirmish: 2 vs. 2 mode. Skirmish-style gameplay minus one teammate. Elimination: 3 vs. 3 mode. Players attempt to wipe out the entire enemy team out. Each round lasts for two minutes. If neither team is dead after time expires, the first team to capture a Control point wins. Inferno: A game variant featured on one of six different game modes. Radar is disabled, and point scoring is simplified. Can be featured on Clash, Control, Rumble, Skirmish, Salvage, or Supremacy. Mayhem Clash: 6 vs. 6 mode. Ammo crates spawn more frequently and abilities charge more often. Mayhem Rumble: Free-for-all mode. Ammo crates spawn more frequently and abilities charge more often. Salvage: 3 vs. 3 mode. Players fight over relics similar to Control. One team must deploy a probe while preventing the other team from disabling it. The first team to reach the score cap wins. Zone Control: 6 vs. 6 mode. Only captures of zones count towards victory. Iron Banner: 6 vs. 6 mode that rotates themes every time it comes back. Only comes around once a month, and players can earn greater rewards through completing bounties and playing matches. Special Iron Banner-themed weapons can either be earned through combat or bought via the vendor located in Felwinter Peak social space. Trials of Osiris: Special Elimination-style mode accessed only through a Trials Passage. Players attempt to wipe out all three players on the other team. Teams are eliminated from the tournament when their team gets 3 losses. Flawless victory (9 wins and no losses) awards access to a secret social space known as The Lighthouse, where they have a chance to get special ToO-themed weapons and armor. Sparrow Racing League: A unique event that doesn't involve traditional PVP combat, up to 6 players race their sparrows through purpose-made tracks littered with speed-boosting gates, NPCs, and the occasional windmill, forklift or turbine, as well as other obstacles. The first player to cross the finish line after 3 laps is the winner, and all players have a chance at receiving SRL-themed armor, ornaments, Chroma, and weapons. While Sparrow Racing League ended after the Live Event "The Dawning" concluded, it is still accessible via private matches. Doubles: 2 vs 2 mode. The mode rotates every so often and are restricted to small team tactics such as Elimination and Salvage. Breakthrough: 4 vs. 4 mode in the Competitive playlist. Players must battle to control the Breaker, which allows them to hack the enemy team's Vault. Once the central Breaker is controlled, it can’t be recaptured and the other team must defend the Vault. The attackers need to capture the Vault before time expires in order to win the round, or else the defenders will earn the point. Countdown: 4 vs. 4 mode in the Competitive playlist. Similar to King of The Hill where Guardians must defend a central charge from an enemy team. Control: 6 vs. 6 mode in the Quickplay playlist and 4 vs 4 in the Competitive playlist. Players must fight for control of three zones around each map for extra points once time runs out the team with the most points wins. Survival: 4 vs. 4 mode in the Competitive playlist. A variant similar to Skirmish where Guardians fight against their enemies with a limited selection of lives and revivals. Clash: 6 vs. 6 mode in the Quickplay playlist and 4 vs 4 in the Competitive playlist. A Team Death-Match mode where players fight until the time runs out, with the team with the most kills taking the win. Supremacy: 6 vs. 6 mode in the Quickplay playlist. A Team Death-Match mode where players fight and collect crests that drop in order to confirm their kills. Once time expires, the team with the most points wins. Iron Banner: 6 vs. 6 endgame mode. The match type can vary. In Year 1, Power was irrelevant, and bounties and ranks have been replaced by earning Iron Banner Tokens to redeem for Iron Banner Engrams. This was changed in Forsaken, where Iron Banner bounties return and Power levels do matter. Trials of the Nine: Highly competitive 4 vs. 4 endgame mode. The match type can vary. The goal is to earn the best possible rewards by winning 7 matches in a row with zero losses. Teams must start over after reaching 3 losses. Only a single win is necessary to gain access to The Third Spire, but only a team with a flawless 7-win record can reach The Third Spire's apex.